In a country where medieval towns with quaint castles are common, how do you make your town special? Simple, you dip the town in the colours of the rainbow! 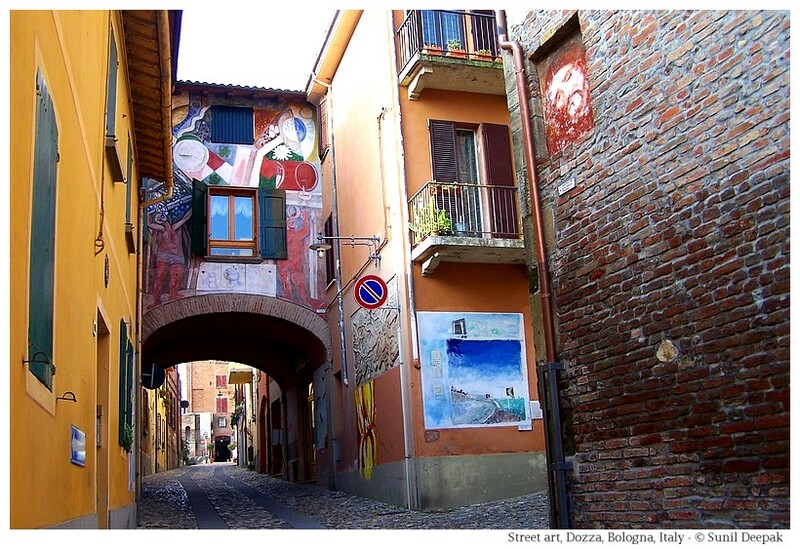 That is what happened in Dozza, a small medieval town about 30 km from Bologna in northern Italy - its walls are covered with paintings. With 6,000 mostly aging population, young ones leaving the town to go to Bologna, Dozza has been in a slow but obvious decline. The town decided to reinvent itself in the early 1960s. They decided that they will have a unique selling point for the tourists, by making their city a vast open-air art gallery. 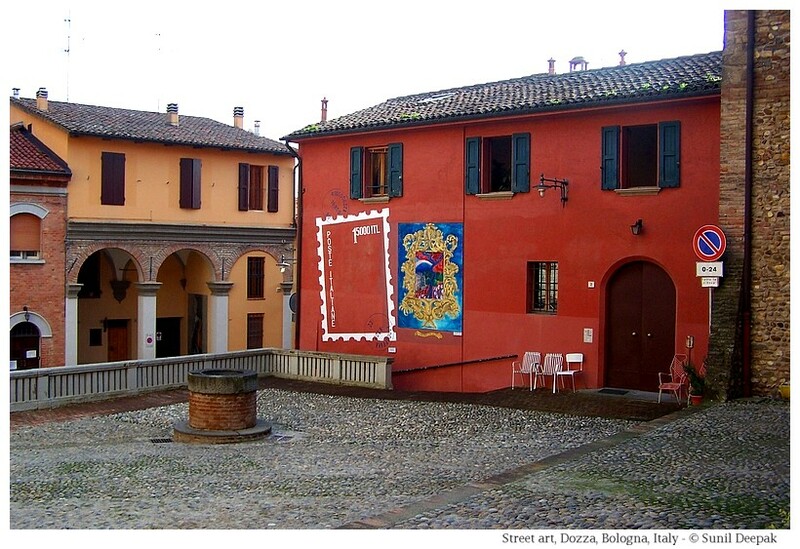 Initially the local artists were asked to make paintings outside on the walls of the houses and the town started to become famous. People came to look at the houses with paintings. Now it holds a painting festival every two years in September. The next biannual painting festival is planned for September 2017. 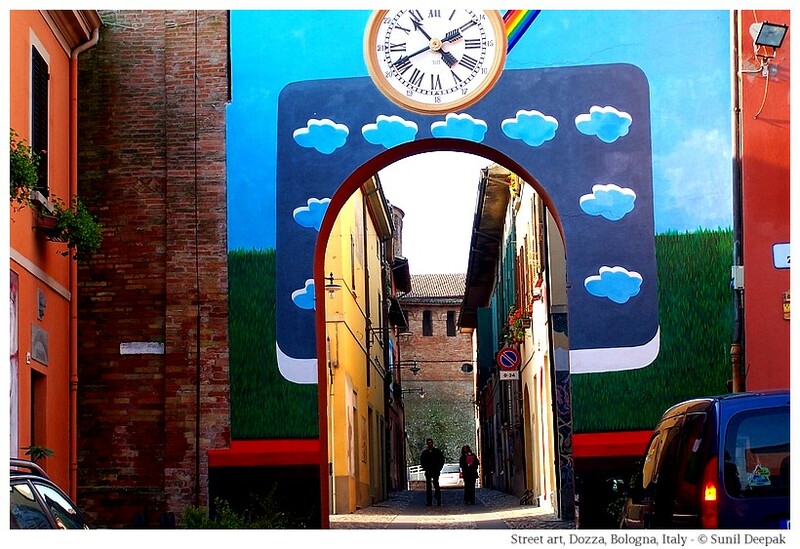 Over the last few years, the wall-painting event of Dozza collaborates with the Museum of Modern Art in Bologna. 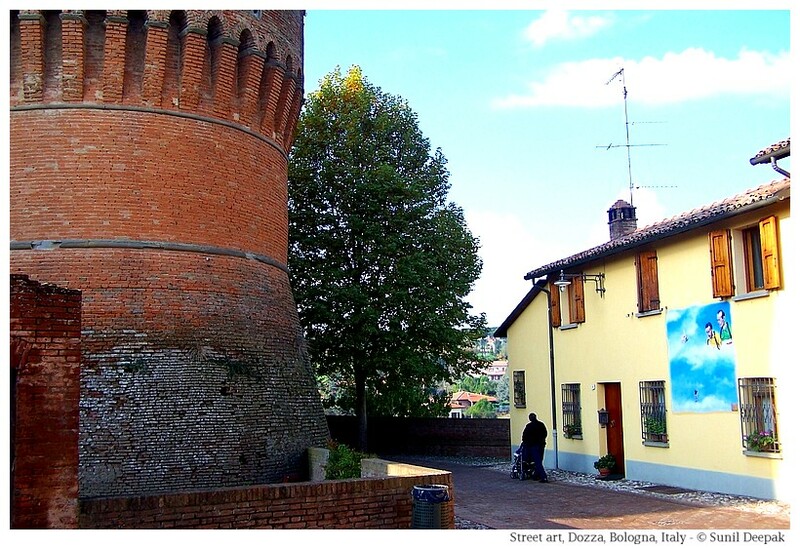 Medieval Dozza is a tiny town, and as its walls get covered with art, some neighbouring areas such as the Borgo Nuovo of Toscanella are also being involved in this initiative. Bologna is an important node for road and railway network in north Italy. Reaching Dozza is easy. It is just 30 km away, so you can drive down. Suburban buses from Bologna going to Imola stop in Dozza. From Bologna you can also take a taxi. 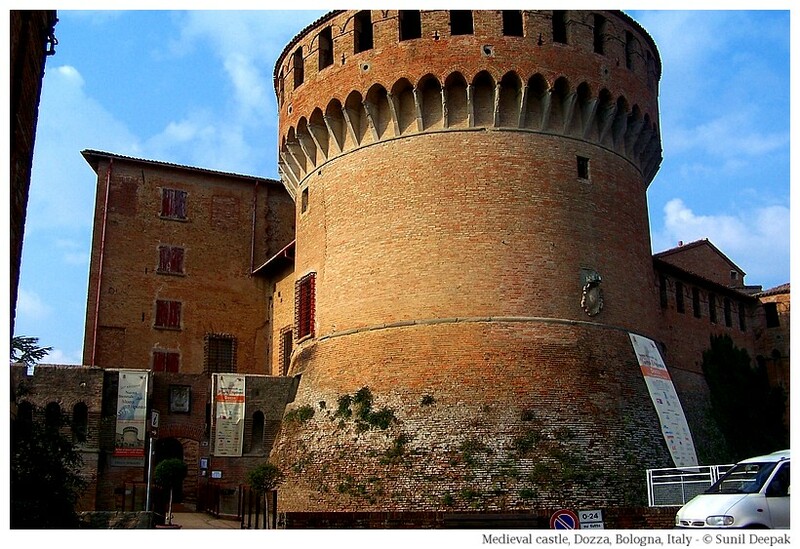 Or, you can take a train from Bologna to Castle San Pietro Terme or to Imola, and then take a taxi from there. Dozza is nestled at the top of a hill, and is dominated by a castle. The surrounding area has gently rolling hills covered with vineyards. The medieval part of the town has ancient pebbled streets that go up and down all around the castle. It is a small area closed by the medieval walls, through which you can have glimpses of the beautiful surrounding hills, green meadows and valleys. Behind the castle there is a park on the side of the hill, full of steps going up and down. 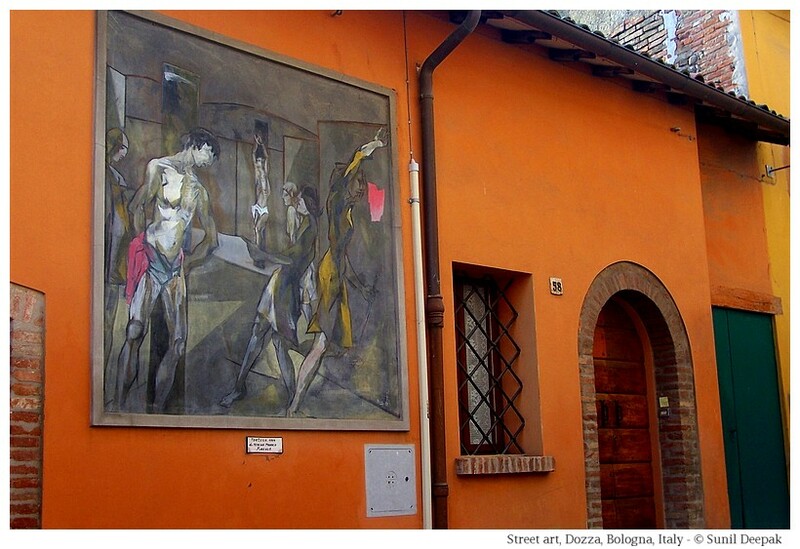 Every street of the medieval town has houses covered with art by different artists. The result is a wonderful mix of styles and colours. Every corner has a surprise. One of my favourite paintings in Dozza has a winter evening and a peasant family sitting around the dining table, with curtains around the window, a fire burning in corner, and a languid cat looking down at you curiously. Another personal favourite has two persons painted in African style who are chatting, where the windows of the house become the ears of the two persons and part of an arch becomes the forearm of one of them. It has a lovely small castle at the top of a hill, belonging to the Marquis of Malvezzi-Campeggi family since 1500s. The last heir to the marquis family died in 1960 and the castle now belongs to the municipality. 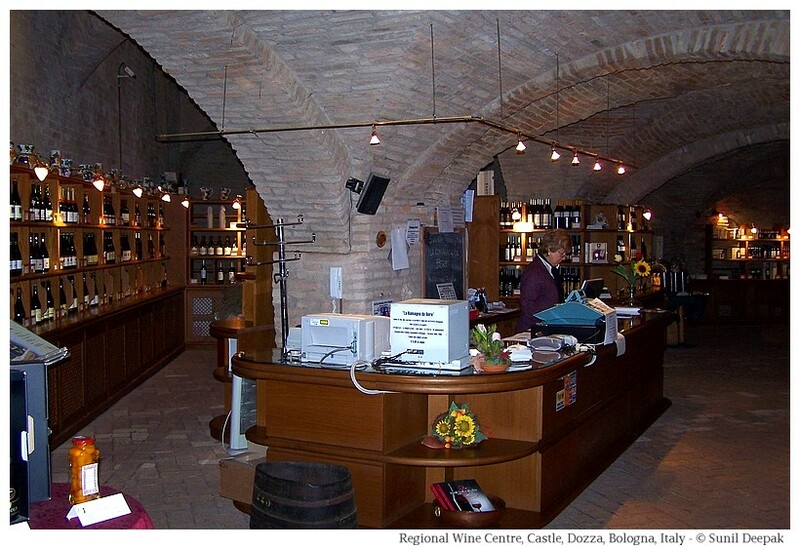 It has a museum and in its basement, it hosts the regional wine centre where you can buy the local wines. The most popular local wine is San Giovese, but there are many more. A famous restaurant, La Locanda del Castello, is on the hillside, not far from the castle of Dozza. The medieval town with its pebbled streets, the small castle and the beautiful paintings, these all combine to make Dozza a special place. 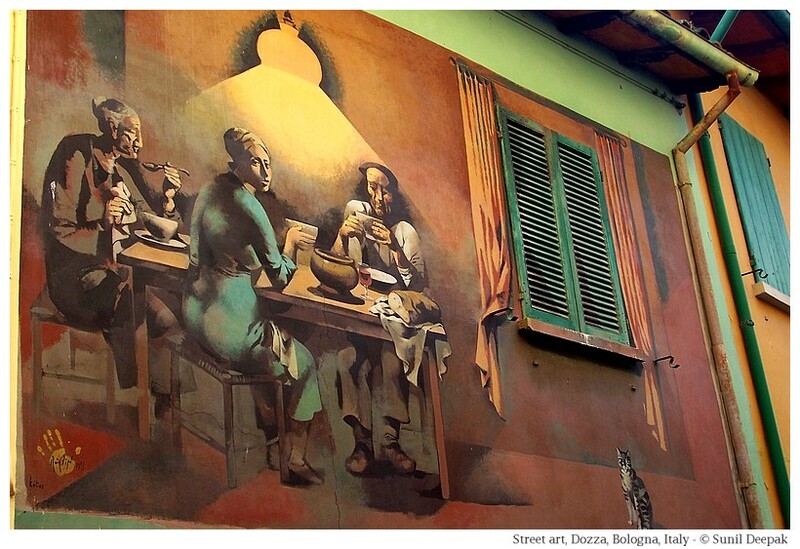 Thus, if you are planning a visit to Bologna, keep a morning for visiting Dozza, it is worth it. Amazing place. Awesome art works. It looks really very fresh! But of course, needs to be kept clean. Thanks Amit. Dozza is not a dusty place. Still the municipality needs to do periodic maintenance of all the paintings. Some of the forty-fifty year paintings have been done new over the old and almost disappeared paintings.